Learn how to choose a durable cable that also gives you the best tone. I will also give you my top 3 recommended guitar cables. Let’s look into each of these categories in reverse order. When I choose a cable, I always look for durability first. There is nothing more annoying that a failing cable. 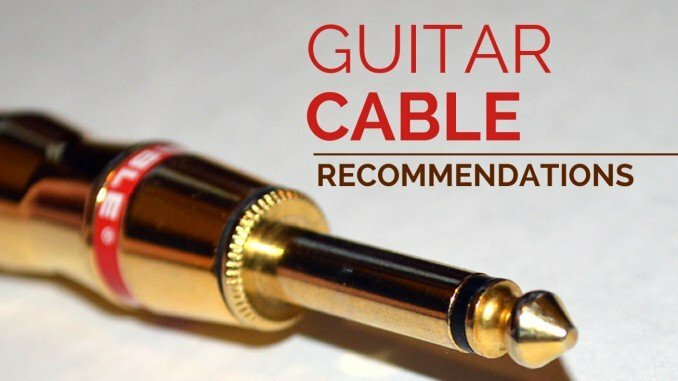 After several cable failures, I purchased a Monster ProLink Monster Rock cable, which was voted the “Favorite Guitar Cable” in Guitar Magazine’s 2009 Reader’s Choice Awards. It has lasted so long that I don’t remember when I bought it, but it was 5-10 years ago. When you plug into your guitar or amp, the cable usually bends at the plug. This puts strain on the solder joints inside the plug, which is usually where plugs fail. The best cables reinforce this area to minimize the strain or to spread it out. End plugs come in two configurations. One allows you to access the solder joints and repair them if necessary. The other is molded to offer protection and strain relief, but you cannot repair the cable easily since the connection is buried inside molded plastic. This protects the connection, but prevents repair. The best plugs have accessible plugs with good strain relief. The middle tier are molded with good strain relief. The cheapest, which I don’t recommend, are accessible but offer little strain relief. I recommend cables with good strain relief. If you’re buying a $10 cable, molded cables probably have the best strain relief. If you are buying a $20+ cable, you should find ones with accessibility and strain relief. 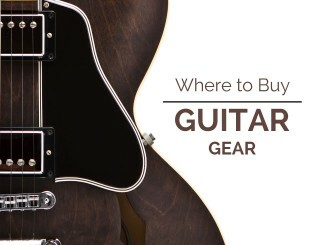 Center conductors are the main pathway for the guitar’s signal. When it fails, the cable is done. This can occur over time as the cable is bent, stepped on, etc. The conductors are usually made of stranded wire, so you can break a couple, but your signal will degrade. Cables with thicker wire will last longer and provide less resistance (to aid your tone). End plugs are usually plated in either gold or nickel. Both are resistant to corrosion, but gold resists corrosion better than nickel. Most guitars and amplifiers have nickel jacks. When you use gold plugs with nickel jacks, the metal to metal may eventually lead to some mild corrosion on the nickel side. In climate-controlled conditions, this effect should be almost non-existent. If you keep your amp outside, in a garage, or unfinished basement, I recommend unplugging your cable when not in use if you have gold on nickel contact. If you want more information on this, you can research galvanic corrosion of dissimilar metals. When gold and nickel contact each other, galvanic corrosion may occur. Indoors, this effect should be minimal. The more practical difference between gold and nickel is that gold is a soft metal that will wear off over a long period of time. Nickel is usually under the gold, so the cable should still work well. 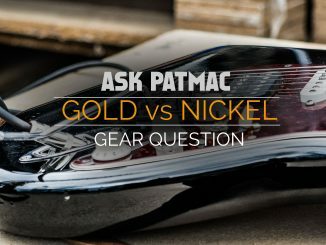 Both gold and nickel have good corrosion resistance. Gold is slightly better. Jimi Hendrix would often use a long coiled cable, which would change his tone. He would switch to a shorter cable when he wanted a brighter sound. This works due to the capacitance of the cable. Practically speaking, high capacitance acts as a low pass filter. This means that the lower frequencies pass through perfectly, while the higher frequencies are filtered out. In other words, you’ll lose your overtones, harmonics, and the brightness of your guitar’s signal if the capacitance is too high. Impedance of the guitar, which is mostly driven by the pickups. Since we’re talking about cables only, cable length is the driving factor. Of course every cable also has a capitance per unit length. For example, the D’Addario Planet Waves American Stage Instrument Cable has a 28 pF/ft capacitance. Most cable manufacturers believe 20 – 30 pF/ft is the sweet spot for capacitance, but your cable length can play a role in this. Some guitarists claim that cables make a difference when you have a long effects chain. For example, many guitarists use multiple stompboxes and cables that extend the total length of the guitar cable. All these items effect the total capacitance. Most guitar cables have low capacitance and won’t be a problem unless you have a lengthy effects chain. Some cables provide the gauge of the wire and not the capacitance. This is less useful, but lower gauges should give you thicker wires, which should provide lower capacitance. I would expect cables to be 22 AWG (American Wire Gauge) or 20 AWG. Shielding will reduce interference with the guitar’s signal, which prevents unwanted noise. Usually, you can avoid interference by keeping your instrument cables away from power cables. Try to run your guitar cables perpendicular to any power cables. If you can’t, your shielding should help prevent interference. Some cables are double-shielded for 100% shielding. Others claim 90% shielding. I recommend 95% or higher shielding from a braided copper shield. Cables are mostly copper with gold or nickel plugs. The tone should not change based on the metal type. Some people claim to hear a difference. There may be a slight difference, but I argue that most guitarists can’t tell the difference. I recommend selecting a cable based on its durability and capacitance over the metal of its plugs. In general, I buy my cables based on durability, capacitance, and price. Here are my top recommendations. If you’re a beginner, I recommend Planet Waves cables. I listed my favorite one below. They have low capacitance, strain relief, and great value. Their cheapest cables only provide 90% shielding, which is ok, but I recommend the one listed below. I have an older version of this plug that has lasted over 10 years. It is molded with excellent strain relief. D’Addario Planet Waves Custom 10′ cable $17.38 (affiliate link – no extra cost to you) – My top value recommendation. George L’s 10′ cable $38.99 (affiliate) – Very low capacitance cable. Eric Johnson uses this brand. Monster Cable Monster Rock 12′ cable $49.99 (affiliate) – I’ve owned this one for years. Well-built and very durable but pricey. I like the Planet Waves cable because it gives you good durability at a low price point. I like Planet Waves for my low-cost cables. I hope this lesson helps you choose the perfect cable for you. If you have any questions or comments, let me know. I’d love to help. If you enjoyed this set of recommendations, please like my facebook page and share my site with your friends.